Welcome to the first edition of Freaky Friday! The absolutely lovely Michaela, from An Affair From The Heart, pulled together a great group of bloggers for this event. Everyone is secretly assigned to another blog, and we then pick a recipe from that blog that we want to make and share! Talk about a fun way to get to know another blog! Please take a minute to check out this great group and see what they made today! A Dish Of Daily Life An Affair from the Heart Aunt Bee’s Recipes Big Rigs ‘n Lil Cookies Café Terra Blog Full Belly Sisters Honey & Birch Life Currents Pic Nic Simply Sated Stephie Cooks The Foodie Affair Who Needs A Cape? I was assigned to Aunt Bee's Recipes. Brandi (Aunt Bee) has so many recipes that will have your family smiling at dinner or supper! I have been a long time follower of Aunt Bee's facebook page, and would shoot over to her blog when something caught my eye... but facebook just is not a great way to keep up with a blog. You miss so much! With all these great recipes, I had a hard time deciding what to make for Freaky Friday. 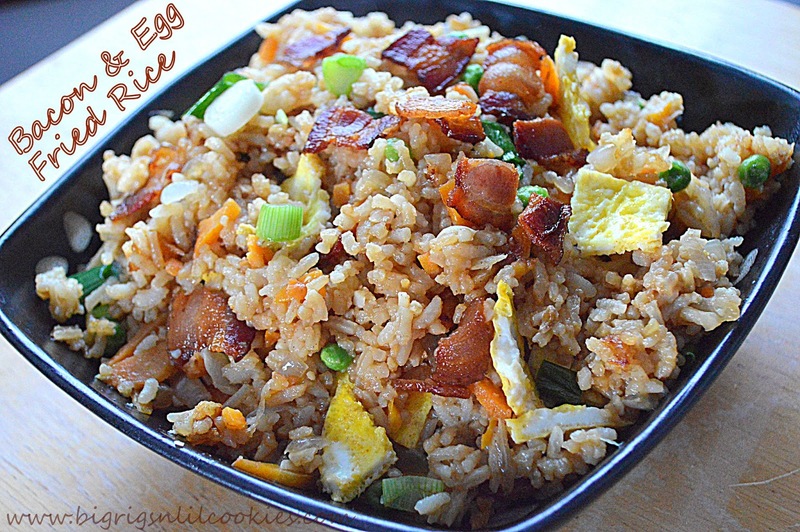 I finally decided on Bacon & Egg Fried Rice, but there are a so many more recipes that I will be making soon. Steak Marsala is definitely up next. We really don't make steaks unless we are out on the grill, and well... this is Wisconsin, sometimes we just can't grill! Aunt Bee's Steak Marsala is made in the oven! Roasted Asparagus with Lemon would be the perfect side dish to accompany so many dishes. And Slow Cooker recipes? Oh yeah.... Check out her Crockin' section! You just can't go wrong spending some time browsing Aunt Bee's recipes! I haven't made Fried Rice in YEARS! Since leaving "the cities" and living the country life, Chinese food is a rare treat. And for me "out of site" is "out of mind", so I just don't make it anymore! Time for a change on that. I miss Chinese food. Brandi's recipe for this dish had some twists that were different from the fried rice I made years ago, so I was excited to try it. And let me tell you.... I was NOT disappointed! It was easy. It was delicious. AND, it was husband approved! That is saying a lot too because my husband does not really care for any rice dish. He loves his potatoes, but when I asked him how good this fried rice was he ranked it between mashed potatoes and a baked potato! That is HUGE! I think this recipe has more flavor the others, including restaurants, which is why Truckin' Man is such a fan of it. Try it. Love it. You won't be disappointed! Be sure to stop over at Aunt Bee's Recipes to see what she made for Freaky Friday! Cut bacon into small pieces, and place in large fry pan (or wok). Cook until just done, not quite crisp. With slotted spoon, remove bacon to paper towels and drain. Remove all but 2 tablespoon bacon grease from pan. Add beaten eggs to pan with bacon grease. Do NOT stir, let set over medium heat for about 2 minutes, or until completely set. Flip egg over (like a pancake), to brown other side. After 1 minute remove egg and set on plate. Cut egg into narrow strips, then cut each strip crosswise to make little squares. Add vegetable oil to pan, heating over medium high heat. Add carrots and onion to pan. Cook, stirring constantly, until onions are transparent. Add garlic, cooking for 2 minutes more, stirring constantly. Add rice, soy sauce, sesame oil, white pepper, and peas. Fry, stirring often, until all ingredients are evenly mixed and heated through; about 5 minutes. Add in egg pieces, green onion, and half of bacon. Stir to combine. Top with remaining bacon. I am so glad you enjoyed the Bacon and Egg Fried Rice! It is one of our favorite recipes! Your photos look fantastic! Who needs a restaurant when you can make a dish like this? Great job! This looks like a very satisfying and delicious meal! Yes! Love the recipe you picked! 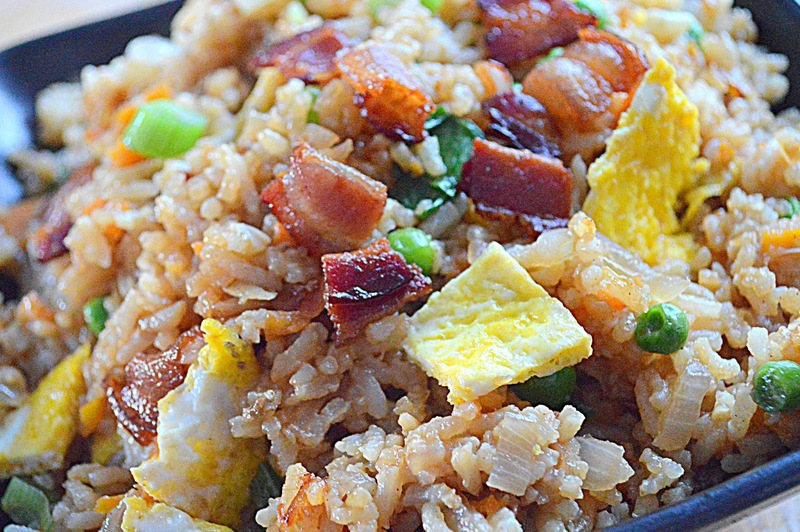 Bacon in fried rice is a great combination. I'm going to make this soon! Yum! I was actually craving fried rice like crazy yesterday but didn't make it. Now I wish I had! Hope you guys aren't still buried in snow like we are. Take care! 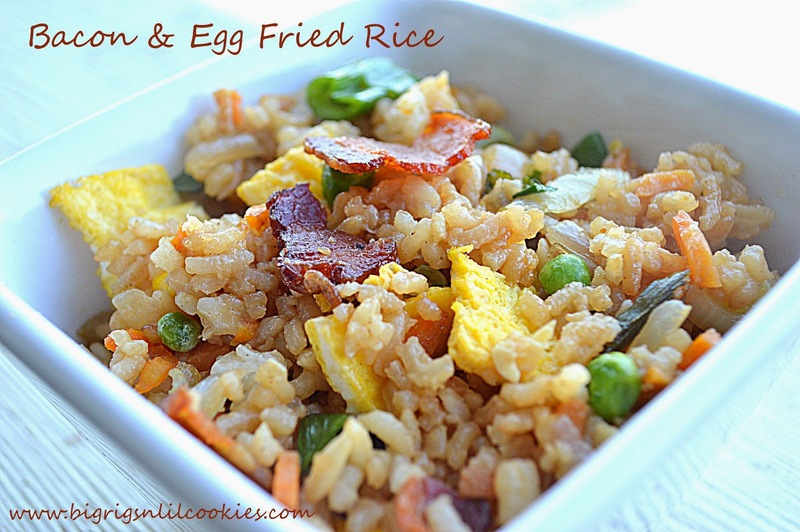 I love rice and cook it many ways, however I have never seen Bacon and Eggs Fried Rice before. Your dish looks and sounds delicious. What an awesome fried rice recipe. I love fried rice and could eat it all the time! And, I especially love it when it has egg in it. 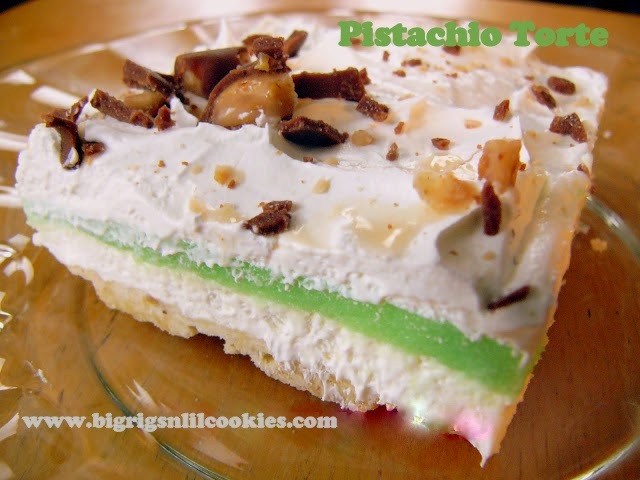 Great recipe and a fun one to choose from Freaky Friday. WoW! I would love this recipe - great choice. Seriously, some of my favorite things all in one bowl. I'm getting hungry for some right now! Freaky Friday sounds like such a fun event! This fried rice looks so yummy! I could definitely go for a bowl of this for lunch! And my kids would love it too! Freaky Friday was so much fun...I loved the introduction to so many new blogs! Pinning this yummy recipe! i've NEVER made fried rice! plus, i've only eaten it a handful of times. i'd definitely prefer a homemade version rather than chinese takeout, and i think this batch sounds absolutely delicious!